Southerner love to throw a party. We can turn virtually anything into a a gigantic celebration. We have many a homegrown holiday to celebrate, like Decoration Day and Mardi Gras. Take a look at the Kentucky Derby for example. The actual running of the Derby is over in roughly three minutes. Secretariat ran the fastest Kentucky Derby at 1:59.40. In that case, the whole thing is over in under two minutes! Now ask yourself how long is the party for the Kentucky Derby? Louisville starts parting a full two weeks before the race. That equals a week of parties for each minute of the actual race. That sounds about right. Gone With the Wind would have been a much shorter book and movie if the law of diminishing party returns had been fully explained to Scarlett. Scene: The Picnic at Twelve Oaks. Scarlett and Melanie sit talking. Of course we will win the war. Our uniforms are prettier. But Mr. Butler says we have no canon forges. Scene: Scarlett and Melanie got to the upstairs balcony and look out at the gathered slaves below. Y'all all free. Pick up your checks on Friday. Now get back to work. We should have two weeks of parties. When Yankees arrived at Fort Sumpter, they would have been in time for the big Emancipation Dinner Dance. And you foolishly went to work! Leave now, there is ice to crush, lemons to peel, bitters to buy. Generally, as big Jack Daniels drinkers, we favor the Tennessee whiskey to the Kentucky Bourbon, but today is Bourbon Day, so we are breaking out the Woodford. And maybe the Maker's Mark or that old school Elijah Craig. While all bourbons are whiskey, not all whiskey is bourbon. Here are some fun facts to impress your friends for National Bourbon Day. Elijah Craig is sometimes credited with being the originator of Kentucky bourbon, but probably not. P.S. Craig was a Baptist minister, who'd a thunk it. In 1964 President Lyndon Johnson signed an Act of Congress that designated bourbon as “The Official Spirit of America.” And you thought it was Diet Coke! There is no such thing as "French " bourbon. Bourbon must be made in America with Kentucky being the bourbon epicenter. Bourbon is made from a mash which is mostly corn, giving it its nickname "corn whiskey." The ratio of corn must be at least 51% but no more than 79%. Bourbon is aged in American White Oak barrels that have been charred inside. Bourbon must be aged two years. So now you know pretty much everything you need to know for National Bourbon Day. We suggest two things -- Bourbon and ice. Fine! If you insist on complicating the whole thing try a Boulevardier. Its basically a bourbon Negroni. Put the liquors in a shaker of ice. Stir, strain and serve with the cherry on top. 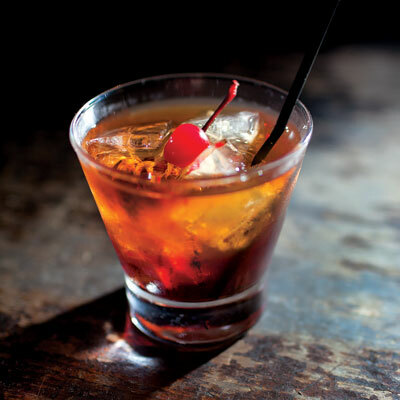 Full Disclosure: We took the photo from Saveur and believe it might be some sort of Manhattan, but it resembled a Boulevardier, and we are writing before our actual drinking begins. Love this! Wish I loved whiskey or whisky but Tom does so I'll pass your post along to him. I'm fond of the Woodford ad on tv during the coverage of the races.